Vancouver, British Columbia--(Newsfile Corp. - March 12, 2019) - LOOPShare Ltd. (TSXV: LOOP) (OTC: LPPPF), world's first fully-integrated electric scooter sharing platform, has been invited to present at the 31st Annual ROTH Conference being held at The Ritz Carlton, Laguna Niguel in Orange County, California, on March 17-19, 2019. LOOPShare's president and CEO, Anwar Sukkarie, is scheduled to present in one-on-one meetings with institutional analysts and investors held throughout the day on March 18-19. He will discuss the company's unique scooter design, telematics and industry-first safety features for its micro-mobility rideshare system. 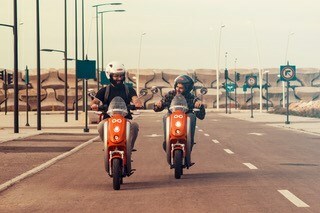 Sukkarie will also discuss the company's recent purchase of more than 400 custom-configured sit-down scooters from a top-tier global manufacturer and plans for global deployment in 2019. LOOPShare Ltd. is an emerging global leader in ridesharing, micro-mobility and sustainable transportation. Through its wholly owned subsidiary, Saturna Green Systems Inc., it has commercialized a first generation, wireless ruggedized 7-inch touchscreen dashboard with telematics functionality for electric inner-city vehicles. LOOPShare's highly specialized display enables a broad range of services for consumer, tourism or commercial use. LOOPShare offers connected end-to-end solutions for inner-city transportation vehicles specifically geared toward Transportation-as-a-Service (TaaS). Through Zone Operators worldwide, LOOPShare is implementing TaaS solutions that offer commuter convenience and tourist applications to subscribers based on LOOPShare's state-of-the-art, wireless electric two-wheel vehicle sharing technology. To learn more, visit www.loopscooters.com. This news release contains "forward-looking information" concerning anticipated developments and events related to LOOPShare Ltd. (or the "Company") that may occur in the future. Forward looking information contained in this news release includes, but is not limited to, statements with respect to (i) the availability of, and benefits from, the Company's various e-Scooter safety features, (ii) the Company's competitive advantages; (iii) the functionality of the Company's technology; (iv) the Company or Zone Operators future profitability; and (v) the Company's growth plans. In certain cases, forward-looking information can be identified by the use of words such as "plans", "expects" or "does not expect", "is expected", "scheduled", "intends", "anticipates" or "does not anticipate", or "believes", or variations of such words and phrases or state that certain actions, events or results "may", "could", "would", "might" or "will be taken", or "be achieved" suggesting future outcomes, or other expectations, beliefs, plans, objectives, assumptions, intentions or statements about future events or performance. Forward-looking information contained in this news release is based on certain factors and assumptions regarding, among other things, the accuracy, reliability and applicability of the Company's business model; the timely receipt of governmental approvals; the timely receipt of e-scooters by the Company ; the success of existing and future operations; the ability of the Company to implement its business plan as intended; the Company's ability to access financing necessary to implement its business plan; the regulatory environments of the jurisdictions where the Company will carry on business or have operations; the impact of competition; and the availability of e-scooters. While the Company considers these assumptions to be reasonable based on information currently available to it, they may prove to be incorrect. Forward looking information involves known and unknown risks, uncertainties and other factors which may cause the actual results, performance or achievements of the Company to be materially different from any future results, performance or achievements expressed or implied by the forward-looking information. Such factors include risks related to acts of God, the impact of general economic conditions, changing domestic and international transportation industry conditions, increases in operating costs, terrorism, currency fluctuations, interest rates, risks specific to the transportation industry, the ability of management to implement the Company's operational strategy, the ability to attract qualified management and staff, labour disputes, regulatory risks, including risks relating to the acquisition of the necessary licenses and permits, financing, capitalization and liquidity risks, including the risk that the financing necessary to fund operations may not be obtained and the additional risks identified in the "Risk Factors" section of the Company's reports and filings with applicable Canadian securities regulators.